Long before TTGL, there was Martian Successor Nadesico. And long before Kamina, there was Gai Daigoji. 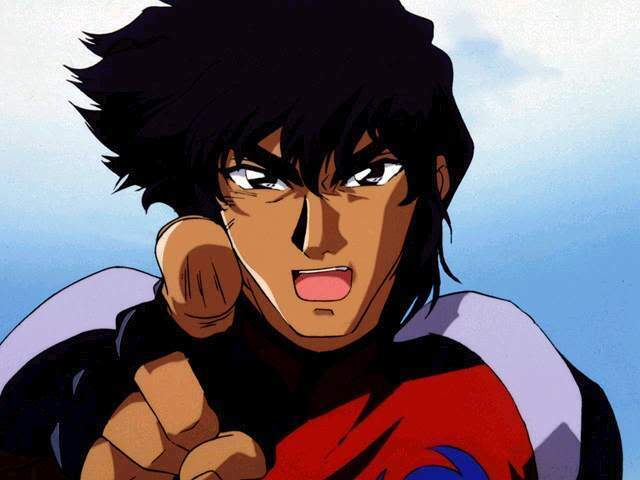 He was born as humble Jiro Yamada, but within him was the spirit of a true super robot pilot. Like Kamina, he espoused the values of hotbloodedness and mechtardery. But he was a true man. He lived in a world bound by real robot physics, where his only companion was a lowly ship’s cook; and yet, despite these insurmountable obstacles, he broke the laws of reason and turned his Aestivalis into a mech to make Kouji Kabuto proud. No pitiful midboss shot him down. He defeated countless Jovians and Feddies. His death was the result of treachery: shot unawares in the hangar of the Nadesico by cowards. He was an inspiration to Akito, and wishful pilots everywhere. Gai was a true man. It is a cruel irony that Kamina, and not he, was to become the face of GAR. This entry was posted in Thoughts and tagged aestivalis, gai daigoji, gar, kamina, martian successor nadesico, mech, mecha, tengen toppa gurren lagann, ttgl. Bookmark the permalink.